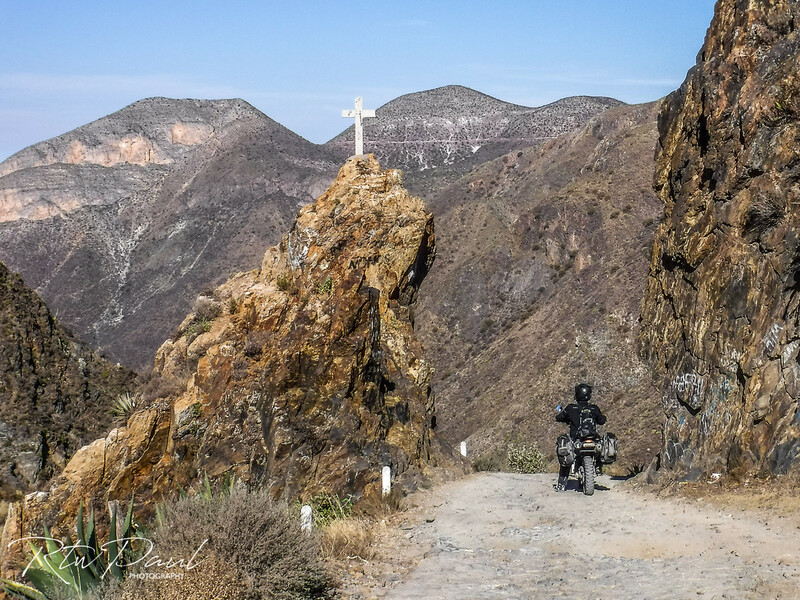 Have you ever ridden down a road so steep it kind of feels like you are going over the bars? 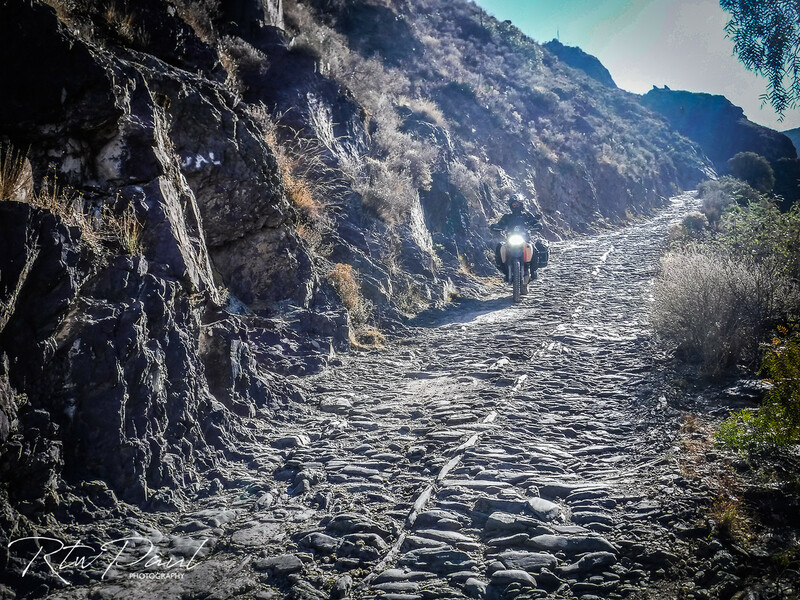 Have you ever ridden down a road covered in cobbles that all seem to want to bounce your front wheel in the opposite direction you are trying not to go? 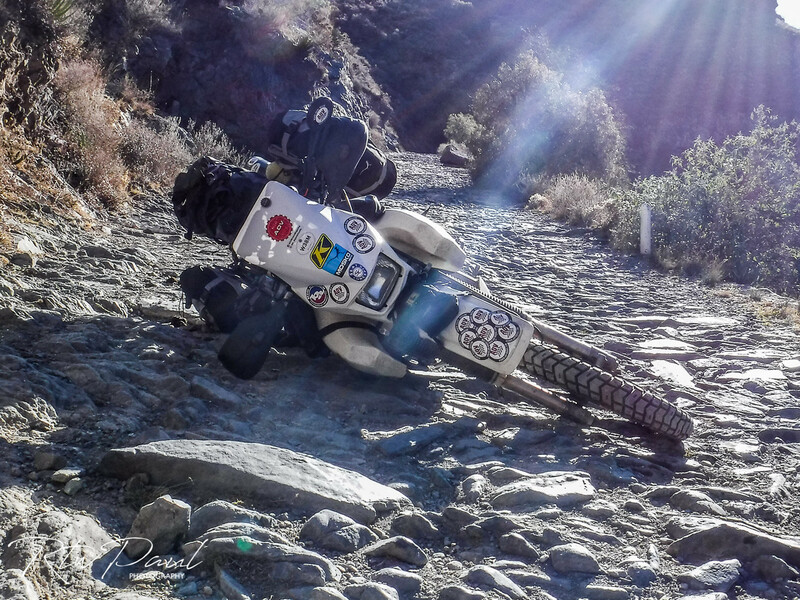 Have you ever ridden a road that there is a sheer drop off one side down to certain severe injury or death? Have you ever ridden along and tried to slow down and your clutch cable starts to snap and the bike surges forward instead of finding neutral it just stays in gear? 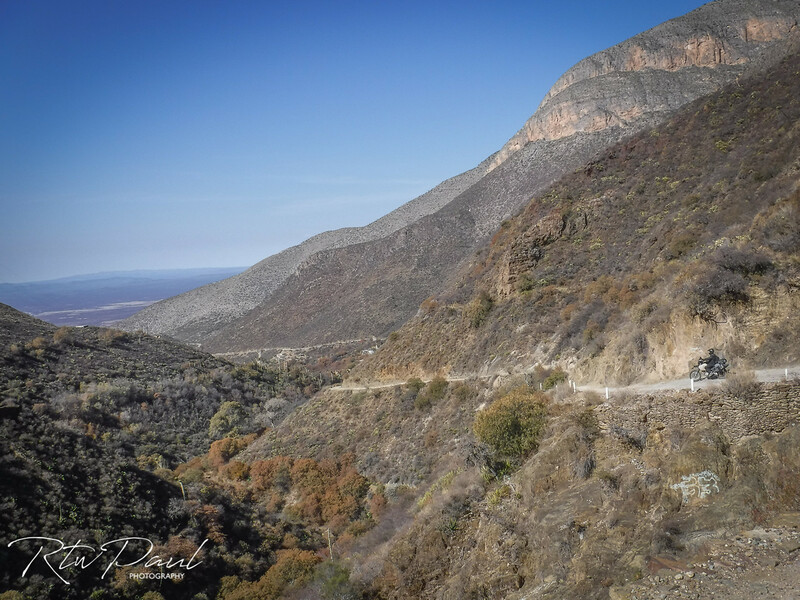 As we roll out of the back side of Real de Catorce, I lead the way out of the little town onto the steep badly cobbled road that leads to the valley below. On the steepest part of around a 200-meter stretch, I hear an almighty crash behind me, I look in my mirror and Egle is down trapped under her bike. I stop immediately kill my bike, but the road is so steep even with the bike in gear it wants to roll forward, the compression isn’t enough to hold it. I spot a rock sticking up that I push my front wheel up against and get off the bike, it stays. I try to run up the hill but altitude, slippery cobblestones and the steepness of the slope slow me to a walk. 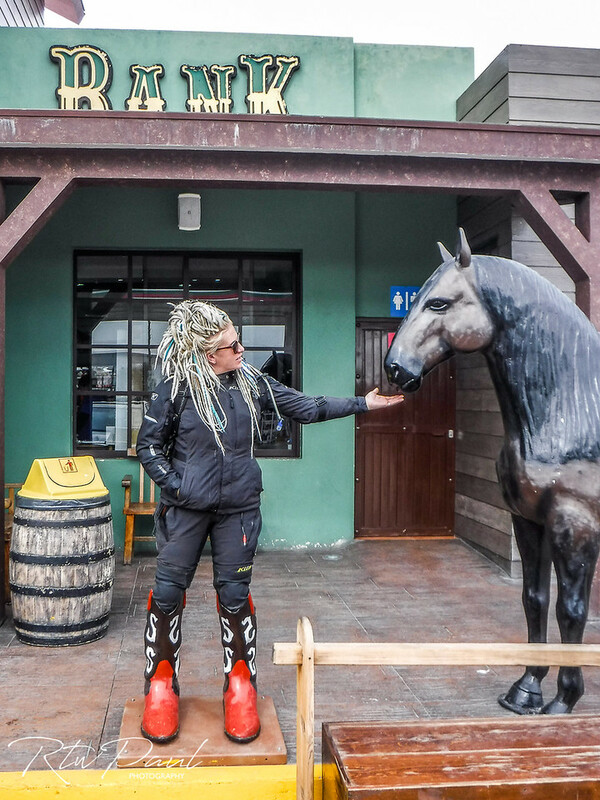 Egle is freeing her leg from under the bike, she looks up, “it was either go over the edge or dump the bike!” She stands up, “I love these Gaerne boots, the full weight of the bike landed on my ankle and I never felt a thing”. it looks almost flat in this shot, believe me, IT IS NOT! We get the bike back up and find out all of those questions were answered “yes” in a nanosecond by Egle! The clutch cable had about 3 or 4 strands left, but it had allowed it to stretch enough that the clutch couldn’t stop the transmission being engaged. She was shaken so I rode the bike down to a relatively flat spot and made an adjustment on the cable to get us to the bottom of the hill. 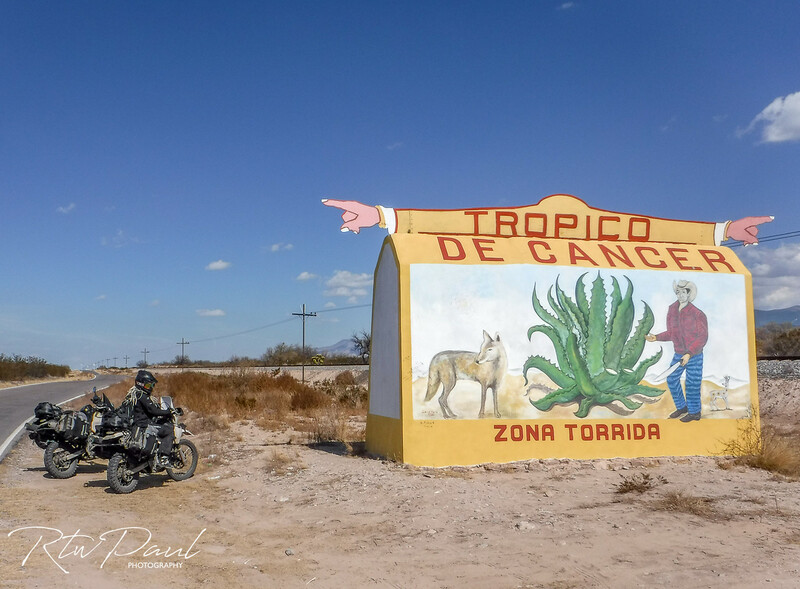 I give her options – ride the bike, hit the kill switch if the cable snaps so instantly doubling the stopping power…or would you like me to ride it down and you ride my bike? what do you want to do? Egle is a rider and will ride in any conditions thrown at here (read her ride report) before I can finish my sentence she is riding by me! I walk down to where my bike is and she tries to capture the steepness of the slope from where she stopped. Impossible to get that shot, the road feels like its a 45-degree angle in parts. Its only about 20km down to the paved road, we were so happy there was no rain, as there would be no way of getting any traction on this section of cobbles. Good in you Egle!! I don’t enjoy those cobbled roads!! And I love your cowboy boots!! Great photos as always Paul. I walked that section of cobblestone as far as the big chimney stack a few years ago. Chose not to take the big GSA down it. 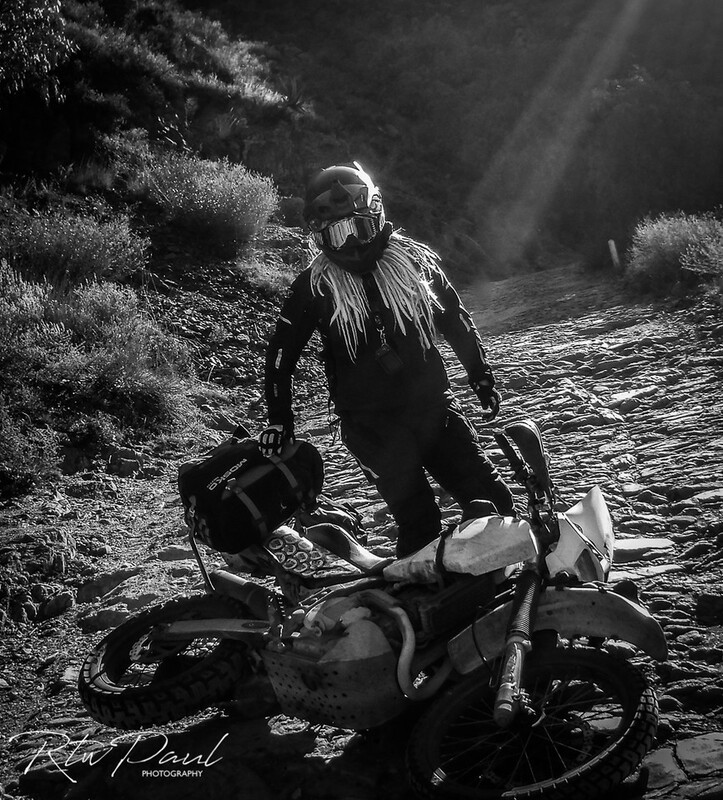 The following year Moto Hank hit a cam-shaped rock and stopped just short of the edge. Donnie Jennings rode it uphill to R14 after offloading his pillion. I think he was on a KTM 990.